Earlier this year, after we got a few inches of snow in ... was it November? ... 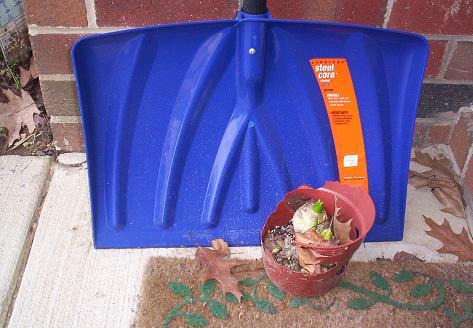 I picked up a new snow shovel. My old one was heavy, rusty metal, and I actually ditched it last spring. Today I took this shot of the still brand new shovel next to a beat up pot of hyacinth bulbs that were left out from last spring. They have no idea that it is January - even though they are completely without shelter. I've considered taking this picture for a few days, knowing that the it would be the one thing that would shift the weather patterns back to the way they should be (I'm not really that delusional, it just seems that way). I'm thinking how nice it would be to put away a brand new shovel in the spring without worrying about scraping off any muck or salt. Judging from the way things have been going, it won't be very long before we'll have lots of herbs popping their heads up, and lots of herbal news to speak of. 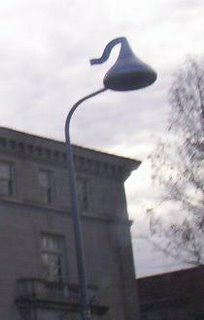 For those of you who have never been in Hershey, PA I thought you might like to see what the streetlights look like. Some are like this, some are plain brown, and some are silver with no "ribbon". I've loved them since I was a kid - even though I really prefer Wilbur chocolate from Lititz (they supply Godiva!). We drove through Hershey on our way to do some shopping for Molly's birthday, and I snapped this shot. 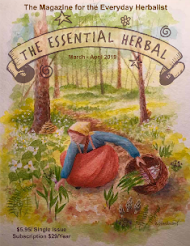 Only a few more days until the deadline for the March/April issue of The Essential Herbal. We've gotten some really unusual articles already and the Yahoo list put together a great feature on edible flowers. I absolutely love the week before the deadline, watching the items stream in, considering how it will all fit together, and wondering how the potpourri that is the magazine will shake out again. The Endoscope and the humor in life. Well I had to have an endoscopic (upper gi) procedure done this yesterday. It really doesn't bother me, because the meds they use to knock you out are so gentle. My first experience as a child involved ether - which smells (and tastes - yuck, yuck, yuck) exactly like those Easter egg dyes that come in the little glass bottles. Later I went through some sodium pentathol, and the following 2 decades of various anesthesia. So there I am, on the gurney, IV in, Oxygen in, clamps and wire harnesses on, propped into the perfect position with the one nurse poised to insert the mouthpiece, and the anesthesiologist poised to stick the sleepy juice into the iv .... when the fire alarm goes off. Now, I don't know what sort of face I made, but the doctor found the situation practically hysterical. He could not stop laughing. I said... ya know, I'd like to wait a few minutes to be sure this is a false alarm. He said, ah don't worry about it. I said, but....but.... and with that they strapped the mouthpiece on and knocked me out. Afterwards, he was still laughing, and said he would have thrown a water blanket over me had there been a real fire. Oh yeah, I'm still laughing about that one. Seriously though, life IS funny. There is never a bad moment that isn't sweetened with the absurd, the bizarre, or the silly. When my mom died last year, we had a gathering at her house. I'm certain that some of her friends went away scratching their heads because we (her children) were fairly cheerful, partly because we had each other. She taught us to see the humor amidst the horror, and I hope they knew her well enough to see that in us. And her death was such a freak accident - combined with the fact that her only brother had died the day before her accident.... what do you DO with something like that? In one of Stephen King's books (Rose Madder?) the bad guy eventually goes really over the edge, and at some point uses a sock puppet to inform the victim that they are in trouble. The sock puppet says, "OH OH". My sister and I laughed over that one for a long time, till our sides hurt. Now when something goes horribly wrong, one of us will hold up our hand as if it were a sock puppet, and make it say "OH OH". I'm not going to list bad things that happen. Here's hoping that you are one of the people who can find the humor in everyday. I'm so grateful that I am. Did you know that Candlemas is also Groundhog Day? This is coming up on Feb 2, btw ( Easy for me to remember my brother in law's birthday, because it is Groundhog Day Eve). The ancient Celts celebrated February 2nd as the mid point of winter. It was considered a good omen for farmers if the sky was clouded over. "If Candlemas Day be stormy and black, it carries the winter away on its back". It can't just be me. 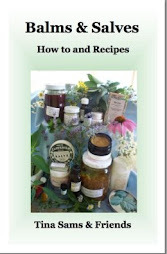 In fact I know that it isn't just me, because I'm on lots of lists on the internet - including the Essential Herbal Yahoo list - and they are all very quiet right now. Nobody feels much like chatting. I needed some pretty, bright flowers. How bout you? So what is it that's going on out there? I have some suspicions that have to do with politics, but won't bother writing them here. Another thing is that the weather has been so mild and nice that it almost makes me feel guilty to want to hibernate. And I DO want to hibernate. I've stuck to all of my resolutions so far, and expect to stay with it. No cigarettes whatsoever, and the patches fell by the wayside a week ago. Also eating in a new, more healthful way and drinking lots of water. Yep, I'm being very good. But it gets tiresome, you know? I'm just happy to not gain weight while quitting, but adding the morning work-outs is really helping too. But where is the energy? Does this happen every year? Do we always hibernate so clearly? I can't remember. Certainly I've never seen the internet so quiet for such a long time. Here's hoping that we all wake up soon... or get some regular winter weather so that it "feels" normal. Whip up some great simple mIn ixes for when the kids come in from sledding or when the hearth is crackling. Place in blender, and blend fully. Store mix in a well sealed container. 1 1/2 T. mix per 8 oz. cup of boiling water. a drop or two peppermint essential oil and a candy cane. of course whipped cream and/or marshmallows. This has been an uncomfortable shift in rates for the USPS. Personally, I think that what we get in exchange for the money is well worth the money. This last change, however, was poorly executed. 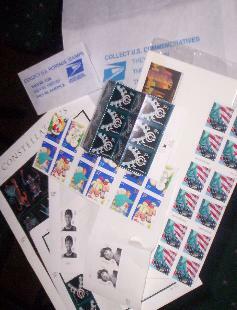 On the 9th I had some packages to mail, and thought I'd also pick up some stamps for postcards and some 3 oz. stamps for subscriptions that come in between bulk mailings. I drove right past the main office in Lancaster, since cars were lined up clear onto the roadway in front of the long driveway leading to the facility. 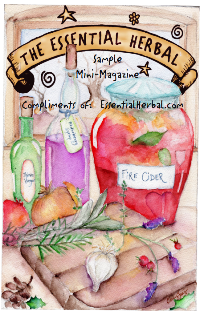 I drove out to Landisville, where we have the mailing permit for The Essential Herbal. The people who work in this office are wonderful. They always send me on my way with a smile on my face. Some visits involve conversation, singing, and once there was even a rendition of a peanut vendor at a baseball stadium - but I digress. The point here is that these people treat their customers like friends, calling many of us by name. As I approached the front door I noticed a hand-written sign to let people know that 1 and 2 cent stamps had sold out. There was a second sign on the inner door. There was a long line. Since I had to park in the back of the building and walk around (as opposed to being able to park right outside at the curb) that there would be a line - but a line in this office never bothers me. As I stood in line waiting, I heard people taking their frustrations out on the clerks. They kept their cool and remained friendly, but I felt so bad for them. At that time I assumed that they had under-ordered the stamps. There were no postcard stamps available yet, nor were there any stamps for the 3 oz. pieces. They apologized profusely and asked me to please return in a few days for them. I returned several days later to ask again. The clerk told me that postcard stamps wouldn't be available until March, and she didn't know when they'd have the 3 oz. stamps. She sold me the old stamps plus some 2 cent stamps. While this seems like a little thing, I mail a lot of postcards, and it takes twice as long to stamp them... it is an inconvenience - but at least I don't need to lick them anymore. And it wasn't that the Landisville office had under ordered - there just wasn't anything for them to order! This isn't huge for me. It won't ruin my life or cause me any major problem. I do use the postal service a lot, visiting several times a week - but I'll live. My problem is more with the idea that a company this huge has no problem inconveniencing so many, nor with putting their employees out there to take so much flak. How many other companies could do something so badly and continue in business? 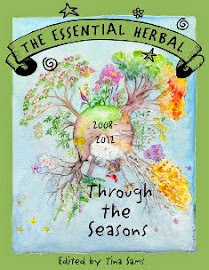 Here at The Essential Herbal, I've been pondering this entry for a few days, having turned 50 in the beginning of the week. I've been waiting for the walls to cave in... waiting to feel whatever it is that I've watched some of my friends struggle with at this juncture. So far, so good. Being almost the baby of the family, it was easy to sit and listen to the obligatory jokes about aging from my siblings - after all, they're older than me. More than that though, were the resolutions I made for the new year. Last spring brought some rough moments. Foolishly, I started smoking again, and decided to end that on the first of January. At the same time, weight gain was absolutely out of the question (I'm NOT going to buy larger clothing, no how, no way), so I decided to instead try to drop some poundage. They say it is almost impossible, but something clicked for me, and I want to be healthier. Again, so far, so good. A friend had given me a book over the holidays that has really helped put my head in the right place. It is Younger by the Day, by Victoria Moran. There are short essays for each day of the year. Each one is a thought, action, or lesson on being healthier - inside or out. At first, I thought it would be about make-up, or chin exercises, or how to dress to cover up, and only started reading out of idle curiousity. Instead, it is really about how to value each day, savor each experience, and look at life as the gift it truly is. It may be just where my head is right now, but something about this book struck a chord, and it is making the whole process of eating healthy/quitting smoking seem like a natural progression, like a treat rather than deprivation. A couple other things that seem to be helping are natural remedies. I got a kombucha mushroom from a friend, and have been drinking the tea. We always "blamed" kombucha tea for making us open our full-time shop because it seems to fortify the backbone and support the gumption function. I also got some Albizzia Tincture from The Green Spiral. This herb is nicknamed the "happiness herb". I wanted to try it out to see if it was worth recommending, and it seems to be a nice addition to my overall plan. Albizzia will be covered in the upcoming issue with an excerpt from the Herbalpedia - which is also available in the book section of The Essential Herbal. I'm walking more, drinking oceans of water, and Molly and I work out together at the gym. It has been almost 2 weeks. I haven't smoked, and I've lost a few pounds (compared to the 5 or 6 I have gained in the first couple of weeks when quitting before). So as I begin this year at the age of 50, it looks like I just might wind up getting younger by the day. Just thought I'd let you know that it looks to me that these two changes really might be possible to do together. Its early, I know.... but so far, so good. It seems that it has been weeks and weeks since the sun has been able to overpower the clouds and shine down on this part of the country. It has peaked out from time to time, but as soon as I get on a jacket and open the door, it is once again cloudy.... and on occasion spritzing or sending flurries. So today, I couldn't resist - even though I wasn't dressed warmly enough. I was happy to find the chickweed (above) peeping out from under a log, along with some garlic mustard. The overall color scheme is shades of brown, but that can make it easier to see interesting things that might go unnoticed if there were blooms and vivid foliage. 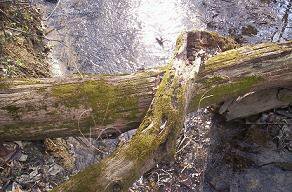 Looking down at the creek, the two logs were moss covered and looked pretty in contrast to the sparkling water rushing underneath. 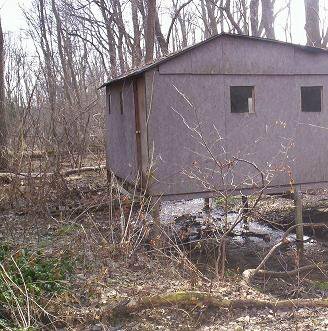 The cabin built over the creek is the same cabin pictured on the current cover, but without snow. My nephew - with lots of help from his Dad! - built this as a fort in his younger days and spent a lot of time reading or snoozing over the sound of the rushing water of the creek beneath him. My daughter enjoyed some days playing there also. At some point I looked up the hill and saw this dying tree. The bark was coming off in large sheets, and the white interior wood of the tree was a stark contrast to the bark that was still hugging the tree. 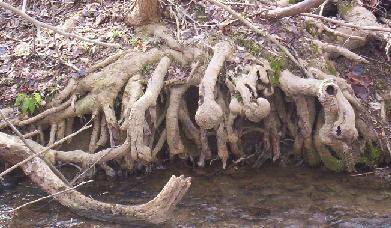 Back at the creek, this creature seems to be trying to keep his feet dry above the rushing creek. I think it looks like a camel, but again, wouldn't have necessarily noticed it if there was lots of growth. It looks like there is a moss collar and leash about the neck, and at the tail there is a young fern growing. 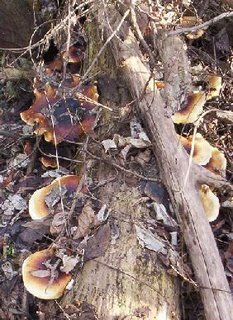 Finally, there were these leather-like mushrooms that initially looked like fallen leaves. They were glossy in the sunlight. It was so good to be outside and get the chance to look around. There will be lots of cold, snowy days ahead. It has been mild and wet here so far - so much so that it almost seems like spring already. But I know it isn't. I know we haven't even started winter yet here. Just for today it was fun to pretend. 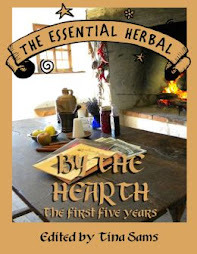 Back in the days when I co-owned an herb shop at a renaissance faire, a great many of our sales would be used as components of amulets, talismans, potions, charms and spells. More often than not they were used to draw love to the one purchasing the herbs. The only other purpose that even came close was the drawing of money or success. As little children we learn to pull the petals from daisies to learn if “he loves me, he loves me not”. Twisting an apple stem while reciting the alphabet tells the first letter of the future spouse’s name. On and on – so many ways to learn of that one true love. And lets not forget that this is a leap year. According to tradition, women proposing to their chosen mates are not considered to be unduly forward during this window of time. In Scotland, tradition held that a red flannel petticoat was to be worn visibly beneath the dress during the proposal, lest the intended felt inclined to reject the proposal….without the petticoat, that was permissible. As Valentine’s Day draws near many will be wishing to learn of their lover, draw someone back to them, or feel more secure in the relationship they already have. In a sense, all potions, charms, and spells are a means of visualization, helping a person to focus on that which they truly desire. Personally, I find that the best way to find true love is to give up completely, decide it would be a pain in the…uh…neck, and avoid it at all costs. It will then always sneak up and take me by surprise. Talismans are often made to bring love. An easy way to remember the talisman/amulet quandary is that talisman starts with a “t” as does talisman. Amulet starts with an “a”, as does away, thus amulets keep things away. A very simple love amulet is made by stringing rosehips into a necklace and wearing it about the neck. A more precise talisman might go something like this: start with a square of cloth, red for love. After considering what characteristics would be desired, find herbs (and other objects) that will represent and correspond to those traits. Someone down to earth? Add a pinch of patchouli. Spicy lover? Cayenne pepper. You get the idea. Traditionally, it would seem that rose petals are an absolute must-have. Now lets make a few romantic items to add to the mood once you’ve found that special someone. These can also be made ahead in anticipation, and if all else fails, there are always those danged bridal showers. Bathing herbs can be used in several ways. Unfortunately, allowing them free rein in the tub is not one of those ways – word to the wise. The easiest, most effective way is to use a large pitcher filled with very hot water and put about ½ c of the blend into a square of cloth, tied loosely. Allow the “tub tea” 5-10 minutes to steep (longer if desired), and then pour into the bath as it is drawn. Some people tie a muslin bag filled with herbs to the faucet to catch the water as it comes out. Others still just throw the bag right into the tub. All of these methods are fine. Add to this mixture 20 drops each of lavender essential oil, patchouli essential oil, rose fragrance oil, and musk fragrance oil. Mix very well. Use approximately ½ cup per bath. This recipe makes quite a large batch, and can easily be halved. It’s such a nice blend that you will want to make up the whole thing. Very few things are as romantic as taking time out to give your lover a nice relaxing massage. Not all of us are trained in the art of massage, but in this instance it truly is the thought that counts. A back rub that is delivered with love and care very rarely goes wrong. A fragrant oil makes it all the more pleasant, but remember to keep the fragrance light. Too much can be overpowering if you are covering large areas, and if using essential oils (of course!) it can get to be too much. 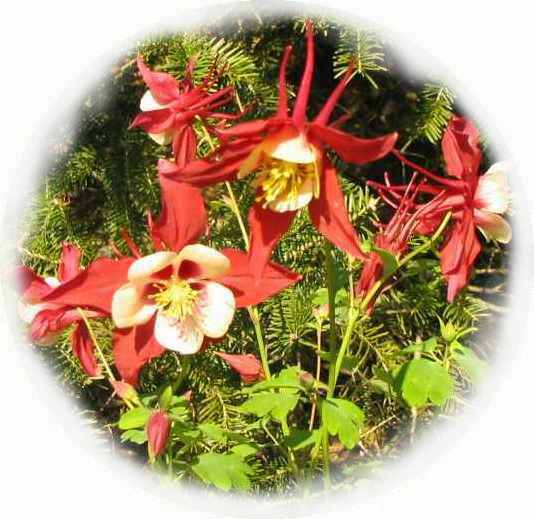 10 drops of essential oil per ounce of carrier oil is about the proper strength. 2 ounces Sweet Almond Oil (almost any vegetable oil will do, but the almond is special to the goddess of love). Blend ingredients and allow to rest for a few days so that the scents mingle. Put into a bottle that is pretty – but usable. A top that allows only a few drops to come out at a time is very helpful. Remember to always pour the oil into your hand to warm it, rather than dropping it right onto the skin you are about to massage. Candles scented with the essential oils of rose, jasmine, ylang ylang, cardamom, oakmoss, patchouli, and/or sandalwood would be lovely to burn during this evening you have spent time thinking about. The same fragrances in the form of incense can also be used. A nice light dinner and CD of Native American flute music completes the mood.